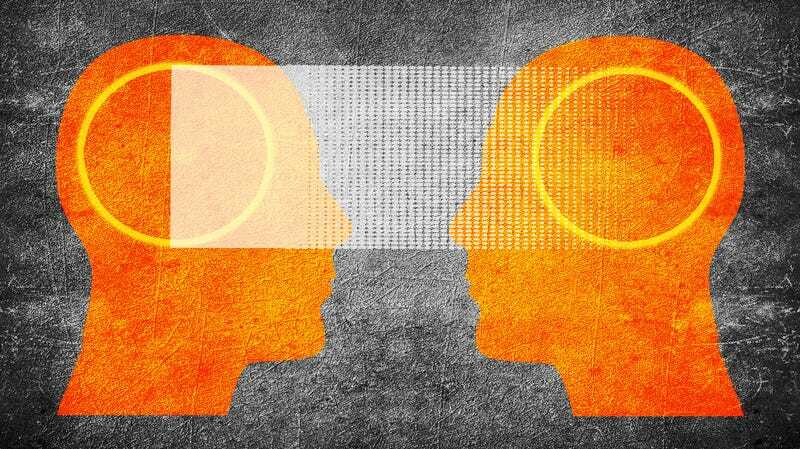 We’re still a long ways off from achieving technologically-enabled telepathy, but a recent question-and-answer experiment by researchers at the University of Washington shows that progress is being made. Last year, the same group of scientists created a rudimentary brain-to-brain communication interface (BBI) that allowed participants to collaborate on a computer game. Remarkably, the system was completely non-invasive (that is, not a implanted brain device). An EEG device, worn as a cap, monitored electrical activity in the brain of the “sender,” which was transmitted to a computer for processing and translation. The interface then sent a signal to the “receiver,” which was delivered via transcranial magnetic stimulation (TMS). Though primitive, the system caused the receiver’s hands to trigger a touchpad. Taking this system one step further, the researchers sought to determine whether a similar configuration could be used to enable a pair of participants to play a question-and-answer game (similar to 20 questions) by transmitting signals from one brain to the other over the Internet. The research was led by Andrea Stocco, an assistant professor of psychology and a researcher at UW’s Institute for Learning & Brain Sciences. The team’s work now appears at PLOS One. 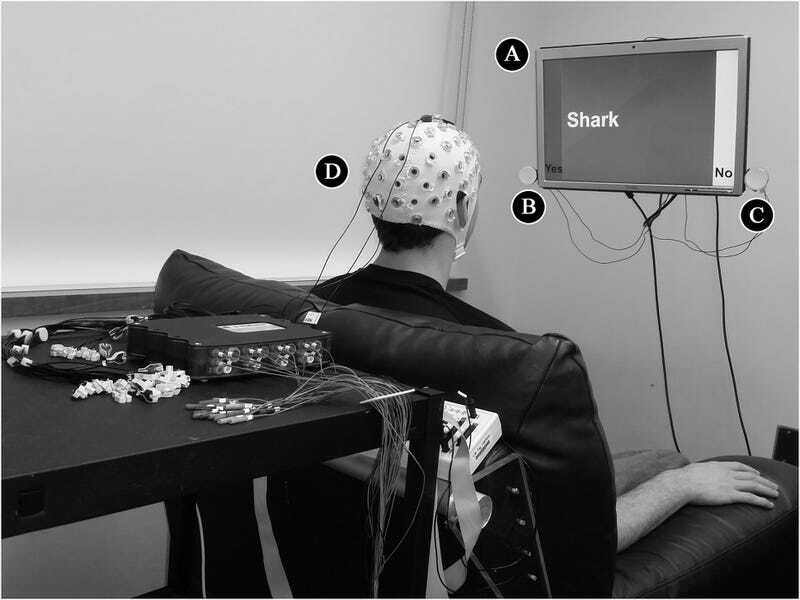 Like the previous experiment, the sender—or in this case the “respondent”—wears a cap connected to an EEG machine that records electrical brain activity. The respondent—the person who knows the answer and responds either “yes” or “no” to questions—is shown an object on a computer screen. The receiver, or “inquirer,” is presented with a list of possible objects and associated questions. The inquirer uses a mouse to send a question to the respondent, who answers “yes” or “no” by concentrating on one of two flashing LED lights attached to the monitor, which flash at different frequencies. The “yes” or “no” response is transmitted to the inquirer over the Internet, and it triggers a magnetic coil positioned behind the inquirer’s head. When a “yes” response is received, the coil stimulates the visual cortex and causes the inquirer to see a flash of light known as a phosphene (the absence of a phosphene indicates a “no” response.). These flashes are produced by a brief disruption in the visual field and often manifest as blobs, waves, or a thin line. Using this system, five groups of two participants, who were located almost a mile apart, played 20 rounds of the question-and-answer game. Results showed that inquirers were able to guess the correct object, like a dog, in 72% of the games, compared to 18% in the control group. Two control groups actually achieved perfect scores. The researchers say that some of the incorrect answers had to do with uncertainty about whether a phosphene had appeared. This particular BBI design has obvious limitations. It’s clunky as hell, extremely basic in terms of informational bandwidth, and unidirectional (though it would be relatively easy to create a bi-directional version of this system). But as a proof of concept, it shows great potential as an assistive device for people with cognitive or behavioral disorders. The researchers are hopeful, for example, that a similar system could be used by people with Broca’s aphasia, a condition that prevents individuals from speaking fluently even though comprehension is relatively well preserved. And of course, it’s another step—albeit a very tiny one—in the direction of more advanced technologically enabled telepathy. Read the entire study at PLOS ONE: “Playing 20 Questions with the Mind: Collaborative Problem Solving by Humans Using a Brain-to-Brain Interface”. Email the author at george@io9.com and follow him at @dvorsky. Top image by lolloj/Shutterstock.